People with arthritis often have stiff joints because they often avoid movements that can increase pain. By not moving arthritic joints, however, the stiffness and pain only get worse. Therefore, people with arthritis often benefit from physical therapy. 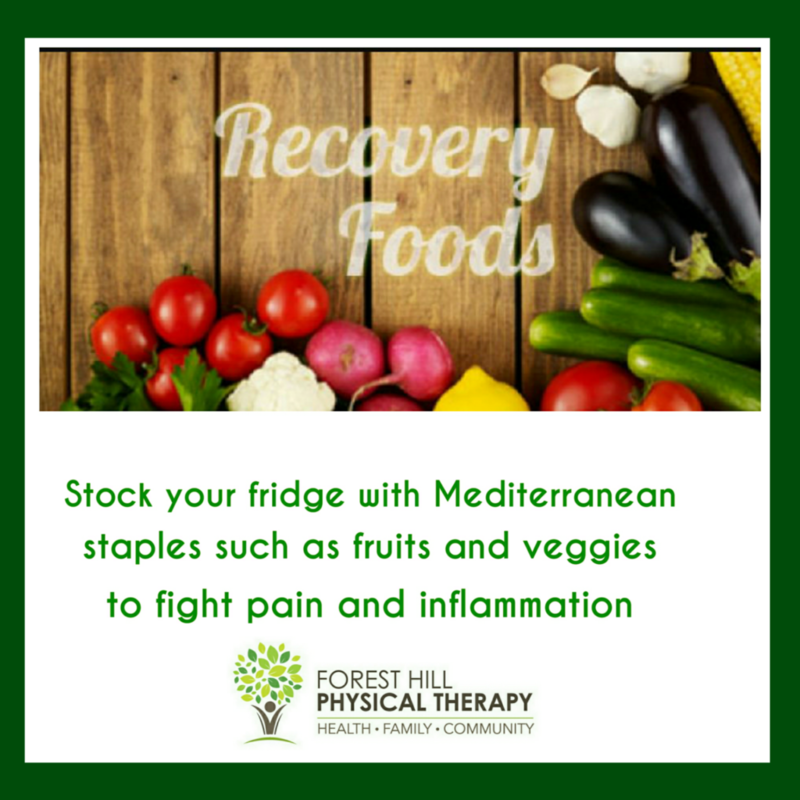 Arthritic patients should stock their refrigerators with Mediterranean staples such as fruits and veggies to fight inflammation and pain. How much: Aim for nine or more servings daily (one serving = 1 cup of most veggies or fruit or 2 cups raw leafy greens). Why: Fruits and vegetables are loaded with antioxidants. Antioxidants act as the body’s natural defense system which aid in deactivating unstable molecules called free radicals that can damage cells. Research has shown that anthocyanins, Vitamin C, and Vitamin Ki have an anti-inflammatory effect. Vitamin C can be found in citrus fruits such as oranges, grapefruits. The appropriate amount of Vitamin C helps in preventing inflammatory arthritis and maintaining healthy joints. Vitamin K-rich can be found in veggies like broccoli, spinach, lettuce, kale and cabbage. Incorporating these veggies in your diet could dramatically reduces inflammatory markers in the blood. The goal of physical therapy in arthritis include improving the mobility and restoring the use of affected joints, increasing strength to support the joints, and maintaining fitness and the ability to perform daily activities. When a patient eats to decrease inflammation and pain, their overall physical therapy plan will be most effective. Copyright © 2018 Forest Hill Physical Therapy. All Rights Reserved.